Before we send off the year with some cheap kazoos and way too much champagne, we thought we should take a moment to reflect on the insane Frankenfoods 2014 wrought. Specifically, the ones from our very own test kitchen. Obviously you need to go back and attempt every single one of our original Thrillist Recipes ASAP, but for now, these are the five that require your immediate attention. Trust us: your hungover NYE guests will thank you for our breakfast lasagna. 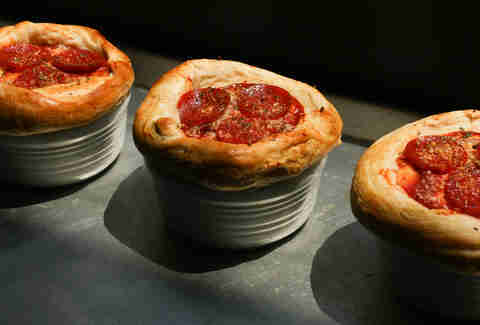 What they are: Single-serve pot pies full of sausage, onions, mozzarella, and peppers with another pizza on top. What you'll need: Spicy Italian sausage, red onion, green bell pepper, pizza sauce, shredded mozzarella, fresh basil, dried oregano, Parmesan cheese, pepperoni slices, egg, water, Pillsbury Grands! Flaky Layers Original Biscuits. How many it makes: 4. 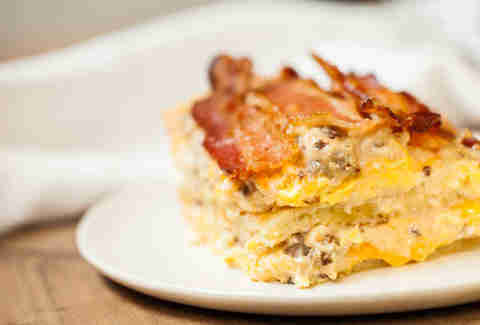 What it is: A "lasagna" that uses pancakes for noodles, and boasts layers of sausage gravy, bacon, and cheesy scrambled eggs. Oh, plus heaps of syrup. What you'll need: Bacon, flour, maple syrup, heavy cream, butter, breakfast sausage, salt, black pepper, cayenne pepper, milk, sugar, baking powder, vegetable oil, eggs, ricotta cheese, cheddar cheese. How many it makes: One 9x13in lasagna. 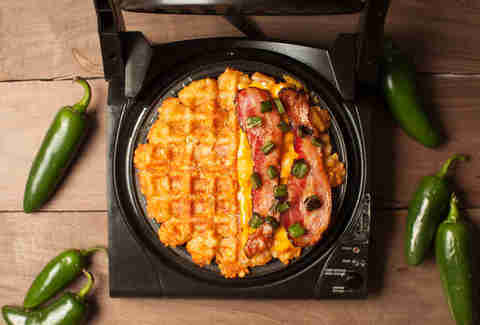 What they are: Grilled cheese sandwiches stuffed with bacon and jalapeño, made with "bread" that's really waffled tater tots. What you'll need: Frozen tater tots, salt, bacon, sharp cheddar cheese, a large jalapeño. 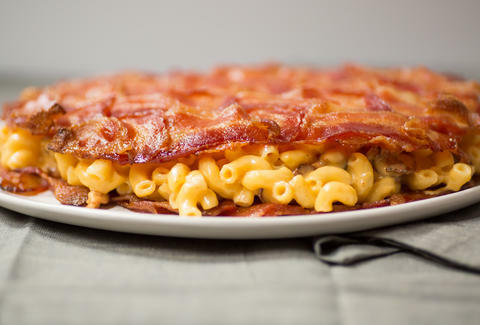 What they are: Bacon weaves packed with homemade mac 'n' cheese. 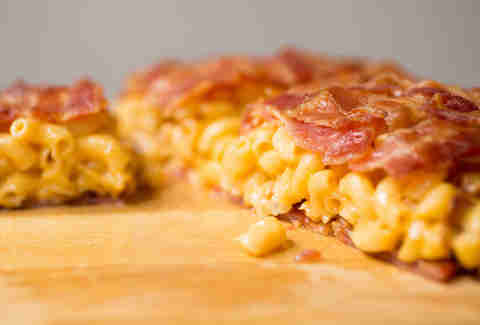 What you'll need: Elbow macaroni, bacon, sharp cheddar cheese, half-and-half, butter, Dijon mustard, salt, black pepper, hot sauce. How many it makes: 6. 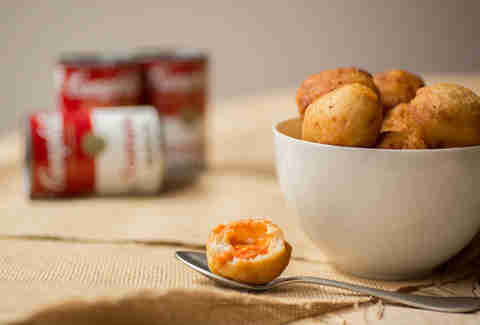 What they are: Tomato soup dumps made out of cheesy bread balls. What you'll need: White bread, condensed tomato soup, Kraft Singles, milk, vegetable oil. How many it makes: 32. Kristin Hunt is a Food/Drink staff writer for Thrillist, and plans to eat nothing but those soup dumplings from now until March. Follow her to hibernation at @kristin_hunt.